The youth from our Pietermaritzburg Sub centre express their heartfelt thanks and regards to you Maharaji and also joy for being given an opportunity to go on air through Radio Hindvani and Radio Lotus programs. They took maximum interest in singing soulfully the two celebrated poems of Swami Vivekananda. The Teachings of Swami Vivekananda has motivated them tremendously. 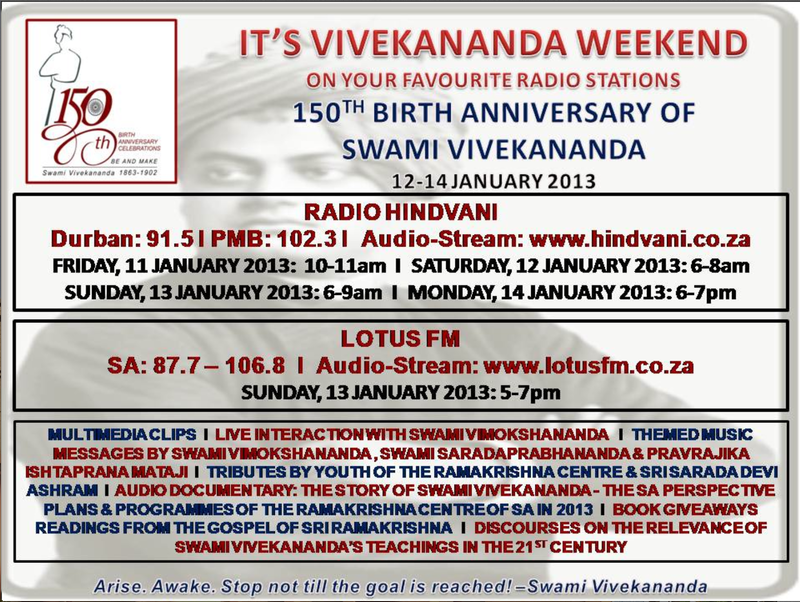 We have regular discussions on ways to spread Swamiji’s teachings in the PMB area. We also thank Maharaji for the encouragment and his constance guidance to move forward fearlessly. Revered Maharaji’s words constantly ring in my ears “HE WHO IS PURE IN WORD AND DEED, SEES EVERYTHING PURE IN OTHERS! By Master’s grace, the regular reading of the Gospel of Sri Ramakrishna has become a way of life now in many devotees homes in PMB. Bhakti Sangeeth was indeed very special yesterday. My entire family sisters, and brother listened as you unfolded the beautiful life of Swamiji and our Master. As a devotee of the Master I felt so humbly proud to belong to this wonderful organization. Some friends whom I met later mentioned how much they enjoyed the programme.